Remember when Warhammer was a game and not a marketing tool? The game will be played out on a 4' by 6' table, which is depicted below. The Percolator is carried in a small chest which is being transported in an elven warwain (a four horse chariot). The Wood Elf contingent has been tasked with protecting the warwain and the Percolator. The Wood Elves are descending into the Chai valley from the north. The chariot is not present in the Wood Elf army list, as this is a GM controlled unit - see the Rules below. The Dwarves are waiting for the elves on the southern side of the river Chai and have set up camp. Of course, the Dwarves are here to collect the Percolator from the elves. Remember that Dwarves and Elves are uneasy bed-fellows (except, of course, for the ill-fated lovers Fasten Luuhs and Testo Sterone!). Players are reminded that Dwarves suffer Animosity towards Elves and that Elven characters may never join Dwarf units. In spite of their racial differences, the Elven contingent will require all the help they can get to transfer the Percolator to the Dwarves. 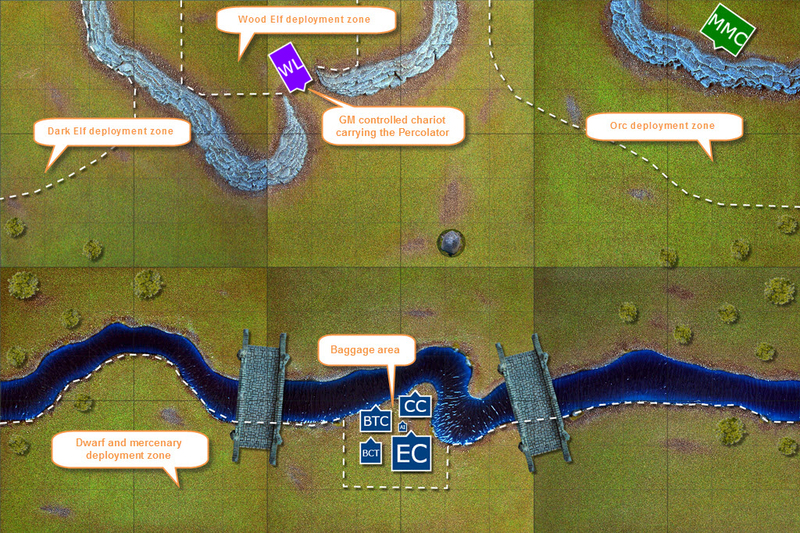 The Orcs and the Dark Elves have elected to separate their contingent commands and try to close in on the Percolator in a pincer movement as it crosses the valley. The Dark Elves approach form the west, with the orcs approaching from the east. Although the overall purpose of the fight is to secure the Percolator, players are advised to take not of the victory conditions - the holder of the Percolator can still lose the battle! Capturing the Percolator whilst maintaining battlefield superiority is the key to overcoming the enemy in this scenario. Chariot: The chariot transports the Percolator and is a GM controlled unit. The chariot type is heavy, equipped with scythed wheels, counts as having no crew and is running amok. All normal rules apply for the chariot, with the exception that the GM determines all rules concerning damage, direction and capturing of the Percolator. The Percolator can be captured by a character in base-to-base contact with the chariot or at a distance by using magic (like the Move Object spell). The exact rules are determined on the spot. Percolator: The Percolator holds magical powers for characters who control it. A character can use the Percolator to prepare K'fe, which enhances a characteristic of the character and the unit he's up to 1 point for the duration of one turn. Furthermore, units within 12" of a friendly controller may re-roll the result of a rout or +1 Ld on a rally test. To prepare K'fe, the character and the unit he's with must stay stationary for one turn. A preparing character and the unit he's with, may shoot and/or use magic. Preparation fails when attacked. 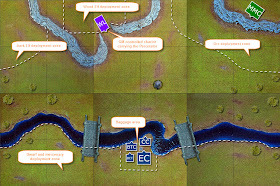 K'fe must be taken at the start of the following turn and the player declares which characteristic is affected. Lovely looking gaming table! Come on the Orcs, I don't trust those Dark Elves though. This is going to be a right laugh as I'm sure in true Orcish fashion my cunning plan probably won't be! Cheers Jonathan, lets hope the evil pointy eared ones keep their side of the bargain. Nice write up! I'm looking forward to seeing this battle unfold. MAn that table looks downright AMAZING! literally making my mouth water! you have outdone yourself DF. Morgrimm, turned to Borri and Snorri, as he took a puff of his pipe, "Ready your axes for deeds of violence!" Borrie and Snorri chuckled to each other, "We will sir....we will." Final orders have been given, the camp is bustling with activity, horns blare as the men gear up. Morgrimm grins to himself and then looks back across the river, as he takes another puff of his pipe.